The toasted Nori sheets usually found in most shops and always in normal commercial sushi is green coloured and cooked at very high temperature and known to contain carcinogens caused by the high temperatures used in processing. We suggest you avoid this toasted nori. Instead, we suggest you use our Raw Nori Sheets which have been dried under 40° C and do not contain carcinogens. This raw nori is the best available and is prized by raw and living food eaters. It has a delicious flavour, a dark brown/black colour and are of a stronger consistency which make them harder to tear than the toasted nori sheets. This organically grown nori from China is certified through OCIA (Organic Crop Improvement Association) International, one of the world's oldest, largest and most trusted leaders in the organic certification industry. No chemicals or artificial fertilizers were used to raise this seaweed. They are regularly tested for toxins, fuel oil and pesticides. The nori farmers are also paid living wages and share in the profits. 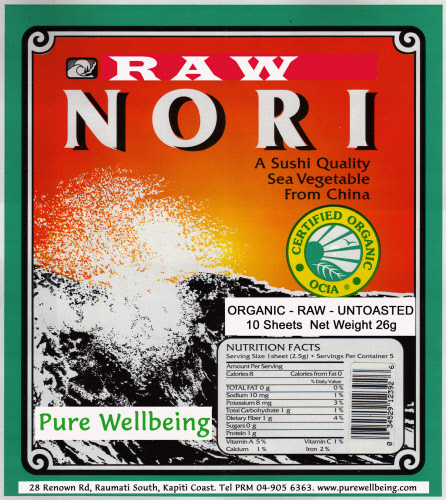 Nori seaweed is high in fibre, protein, vitamins and minerals. Compared with dairy products, seaweed provides up to ten times more calcium and iron by weight, and an extremely high amount of important trace minerals. Nori is traditionally eaten to strengthen the circulatory system and help lower cholesterol. Nori also contains Vitamin A and C.
Use this delicious low-fat, nutrient-dense food wrap to make raw nori rolls (wraps). See one of our favourite recipes below. Nori can also be torn into small pieces to season salads or other delights. Kali & Parvati, our raw food pussies, love to eat this raw nori torn into small pieces & their fur has become even glossier! Basically you can fill the rolls with whatever takes your fancy. We often mix all of the above (or whatever is in the fridge, garden etc.) in a large bowl & add some tahini to help bind everything. On a dry chopping board, place one sheet of nori horizontally facing you & then spread a couple of spoons of your mix onto the horizontal half of the nori sheet closest to you. Spread evenly. If you`ve not done rolls before you'll soon discover how much is the right amount. Roll the nori like a cigar or you can use a bamboo sushi mat. To seal, put a little water on the edge just before you finish rolling it. You can cut into bite sized pieces if you want (clean your knife between each cut & cut very slowly to avoid tearing the nori) or just serve as one long roll - 1 or 2 x per person. Great for picnics & a fun way to get the high minerals of the seaweed into kids as they can help you make them.